Patricia Welch, was born in Steubenville, Ohio. She was born into an Italian family named "Carpico." She attended West Virginia University where she majored in music. Trained classically with former Metropolitan Opera star Francis Yeend. Patricia performed many musical theater roles including Maria in "The Sound of Music," Marsinah in "Kismet," Hodel in "Fiddler On The Roof," and received rave reviews for her outstanding performance as Maria in "West Side Story." She starred with the late Yul Brynner in the role of Tuptim on Broadway in the famous musical "The King & I." Patricia gave a nationally-televised performance at the Hollywood Bowl. She is a guest anthem singer at Dodger Stadium and has performed over 200 concerts and numerous corporate events. Her recording, "If We Hold On Together," is the second in a series of highly successful musical productions. Prior to this, Patricia produced a recording entitled "Stream Of Love." She made several guest appearances with Royal Caribbean Cruise Lines aboard the "Song of Norway." She recorded the lead singing roles for Calista Flockhart & Sharon Stone in two of "HBO's animated "Happily Ever After For Every Child" series. She recorded "You Got Me Dreamin'" for the box office film "Hungry Bachelors Club." Patricia had the honor of singing the National Anthem and "Americia The Beautiful" on two separate occasions for former President Clinton, former President Ford, and General Schwarzkopf. 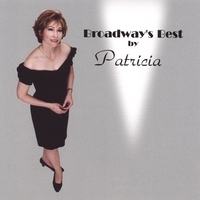 She has just completed her newest recording: "Broadway's Best By Patricia." Following the tragedy of September 11th, Patricia and her husband, Pete DuBarry, wrote a patriotic song entitled "United We'll Stand." They hope it will be a source of encouragement to all of those who have been affected by that tragedy. Patricia performed "United We'll Stand" in Washington, D.C. at the September 11th, 2002 Memorial. She performed the National Anthem for Nascar. In the Britney Spears "Brave New Girl" movie, two actresses who played the roles of Holly and Angela, lip-synced to Patricia's voice. Patricia returned from a tour with Robert Goulet. She was the featured soloist and sang duets with Mr. Goulet in his show "The Man And His Music". 2005 & 2006 Patricia was a featured solist in the Wayne Newton Show. Patricia performed a duet with Robert Goulet, for a PBS Special which will air in October 2007. Recently, Patricia performed the role of "Lady" in "Hat's the Musical" at Harrah's in New Orleans. Patricia has a passion for musical theatre. She is thankful to God for all the blessings "He" has given her, most of all, her husband and family. Patricia Welch has recorded many of my songs written and produced for television and film including 1 for Avatar II (currently in the works). Her voice is nothing short of epic and sweeping without compare. We recently began working with the original themes from SOMEWHERE IN TIME (The movie) and Patricia's voice simply took the material to an entirely new and unrealized place that sends shivers down your spine. She is the best in my estimation; right up there with Streisand / Celine / and Linda Eder. Her voice does belong on the big screen as well as the lead on Broadway (again)! ANDREW LLOYD WEBBER WOULD HAVE MARRIED PATRICIA WELCH HAD HE MET HER FIRST. THE DEPTH AND CLARITY OF HER VOICE IS BALANCED BY HER EMOTIONAL INTERPRETATION OF BROADWAY'S FINEST. SHE IS A PITCH PERFECT STORY TELLER. YOU DON'T JUST HEAR THE SONGS - YOU FEEL HER MUSIC.